Figure skating is another favorite sport of mine. Its actually my favorite sport. I started taking lessons when I was 8, but with my busy schedule, that only lasted for 5 years. I would have loved to have continued though, but with cheerleading, dance lessons, gymnastics, soccer, piano, choir, and band, I was such a busy child! I must have drove my parents nuts They were always driving me to some kind of practice. Now, I've become an avid figure skating viewer. I enjoy watching figure skating competitions on tv as well as exhibitions! Kristi Yamaguchi is by far my favorite figure skater of all time. I found this picture and thought it was the coolest! Martina McBride is a great singer with a such a beautiful voice. Shes always been a favorite of mine to listen to. Ive seen her in concert three times and she is just amazing! Even better was her singing while Kristi was skating. I was so excited about that! 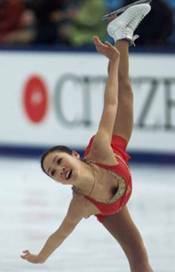 Michelle Kwan: Now, I really enjoy watching her skate as well! Shes so graceful and skates so stunningly when shes out there on the ice. Congratulations to the 2002 Olympic Gold Medalists!! Now, I am finished! I just spend an hour and a half revamping my page and updating everything so hopefully you enjoyed reading it if you got this far! I promise more to come soon!